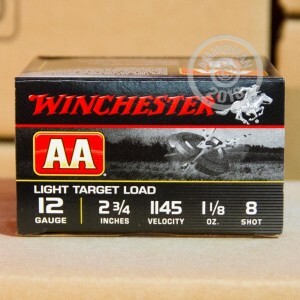 Bring your 12 gauge and get ready for a great time shattering clays or hunting birds--this low-recoil shotshell load from Winchester's AA series enables you to shoot all afternoon without the fatigue of full-power loads. 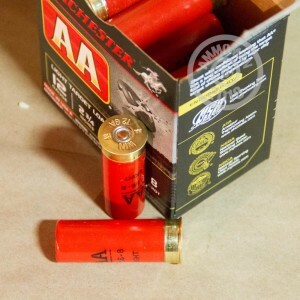 This comes without a loss of accuracy thanks to the AA wad, which features petals that keep all the pellets in a tight pattern without any flyers. 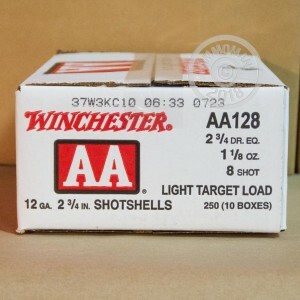 Each 2-3/4" shell in this case of 250 fires 1-1/8 oz. of #8 birdshot at a muzzle velocity of 1,145 feet per second. For the price you cant go wrong on this shell ,Very well made to a standard that is very high,Perfect practice Shells,Thanks again Ammoman for making my day of shooting fun and cheap!!! !